Herman Frank is a German based band created in 2009. Since then they have released 3 albums Loyal To None in 2009, Right In The Guts in 2012 and their newest offering The Devil Rides Out. Band’s name ring a bell? Surely does for classic metal fans from the golden 80s days. You see founder and lead guitarist Herman Frank is no new comer to the scene. Being active in discography since 1982, ex member for the mighty Accept and he has appeared in the ageless classic Balls to the Wall as well as on 2 albums that marked the band’s rebirth, Blood Of Nations & Stalingrad. But wait, this isn’t all! Herman has also appeared in (brace yourself) Hazzard, Moon Doc, Sinner, Poison Sun, the newly formed project Panzer (along ex-Accept Stefan Schwarzmann and Schmier from Destruction) and Victory!!!!! Always handling rhythm and lead guitars Herman can be considered as a guitar master in both departments. No, he isn’t the super shredder type that means no exotic scales, no lightning fast picking, or annoying ringtone style arpeggios. Instead you get solid riffs and fantastic leads that will bring bands like AC/DC, Accept (makes sense), Saxon to mind. Still going strong at the age of 66, Herman effortlessly gives seminars on how a good guitarist should play and on how to achieve a huge and full guitar sound. I swear this guy is like a German version of Lemmy! As for the other members of the band, don’t tell me you’d expect anything less than seasoned veterans who have cut their teeth for years and years in the world of classic metal. Andre Hilgers (Axxis, Rage, Sinner, Vanize, Silent Force just to mention a few) on drums, Rick Altzi on vocals (At Vance, Masterplan, Thunderstone, Treasure Land) and Michael Muller (Jaded Heart) on bass, which is the newest member of the crew. 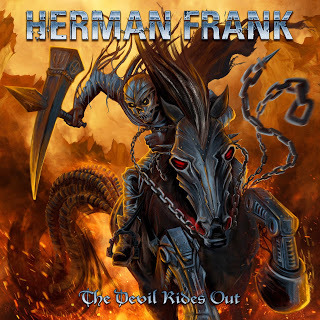 Herman Frank’s newest offering will bring bands like Accept, AC/DC, Victory and Saxon (just to name a few) to mind. From mid tempo boulders like License To Kill and Ballhog Zone to headbanging fast paced ones like Running Back, Shout and Can’t Take It. Some Guns N’ Roses influences surface on Run For Cover, mostly because of the chorus and that was a pleasant surprise! There is no shortage in heaviness in this album but also no big surprises either. If I could make a comparison to the previous albums I’d say that The Devil Rides Out is on equal ground with previous album but a step down from masterpiece Loyal To None. Rick Altzi is doing a fine job as always. His always strong and soulful singing brought David Reece (Accept, Bangalore Choir, Bonfire) to mind mostly due to the fact that both guys have their influences rooted in hard rock from 70s & 80s era. Bass and drums have a strictly supportive role and make plenty of room for the guitar to shine. If anyone asks, yes this is definitely a riff oriented band! Production is strong but now without flaws. Guitar sounds amazing and dominating throughout the album but unfortunately overshadows the rhythm section. Especially drum sound is a bit sterilized and lacks punch. Vocals could also benefit from being a little more forward in the mix. Herman Frank’s latest offering is undoubtedly a strong one. The album definitely isn’t breaking new ground nor does it is mend to. If you’re searching for a strong dosage of strong German influenced metal or a good substitute till Accept’s next album, then search no more and check out The Devil Rides Out.